The name Robert Mueller would ring a bell in the ears of anyone who follows United States politics. But for those who are not au fait, Robert Muller is the special counsel who headed many of America’s biggest investigations. The Special Counsel’s latest investigation, which ran from 2017 to 2019, is referred to as the Mueller probe, Mueller investigation, and the Russia investigation, and is a United States counterintelligence investigation of the Russian government’s efforts to interfere in the 2016 US presidential election. 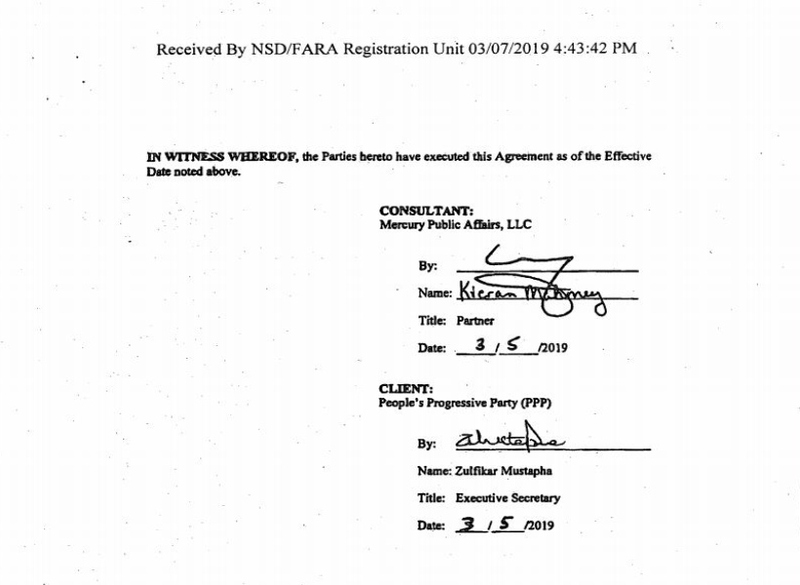 Implicated in that investigation was Trump lobbyist Mercury Public Affairs, LLC, a Delaware based company that was recently retrained by the People’s Progressive Party (PPP) with the “principal aim” of getting the party back in office. 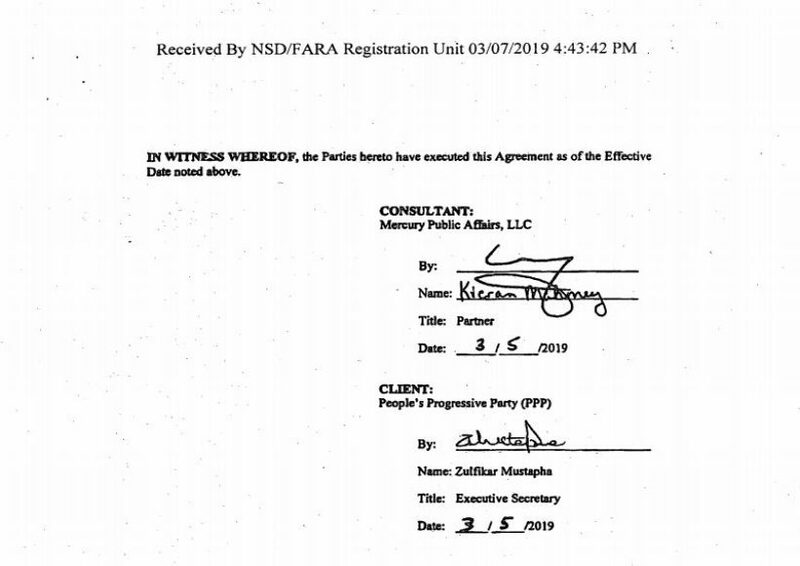 The contract was signed on March 7, 2019 between Executive Secretary of the PPP, Zulfikar Mustapha, and Mercury. The PPP already paid US$31.4M upfront to secure the services of the Trump lobbyists. It is also required to make a payment of US$50,000 on May 1, 2019. The contract states that Mercury will provide the PPP with strategic consulting and management services specific to issues facing the party in the areas of government relations and issues of management. The consultancy firm will also arrange meetings with the Executive Branch and the Congress of the USA, the Organization of American States, and think-tanks in connection with issues relating to the anticipated General and Regional Elections. Research done by this news agency indicates that Mercury has a past that is stained by fines for breach of US lobbying laws. It was also implicated in Special Counsel, Robert Mueller’s investigation, outside of being implicated in Mueller’s investigation into the Russian involvement in the 2016 presidential election which saw Donald Trump becoming the USA President. In fact, when Mueller indicted Donald Trump’s former campaign chairman, Paul Manafort, in the fall of 2017, www.thedailybeast.com noted that Mercury was one of the lobbying powerhouse firms listed as being complicit in a scheme to essentially hide foreign influence-peddling. Under federal law, U.S. lobbyists must declare publicly if they represent foreign leaders or their political parties and provide detailed reports about their actions to the Justice Department. But Mercury did not do this. The company said that its decision was based on the opinion of its outside lobbying ethics counsel, Kenneth Gross. Mercury retroactively registered as a lobbyist for foreign interests in 2017 after it first came under scrutiny. Another news site, the LA Times, also reported that Mercury was fined for violating lobbying laws. It was noted that, in 2017, Mercury Public Affairs agreed to pay US$4,000 in fines to California’s ethics watchdog agency for infringing the $10 gift limit on lobbying firms when it provided dinners worth US$200 to former state Sen. Ronald Calderon and his wife. The fines against Mercury by the enforcement staff of the state Fair Political Practices Commission stem from violating the $10 gift limit and failing to report that Calderon’s wife also received a dinner, according to the investigative report.